"Just want to comment on how happy I am with your service. Has made reordering contacts quick and painless. Thank you." The Focus Dailies Aquacomfort Plus 90 Pack offers a convenient alternative to using extended wear contact lenses or glasses. It is a popular option used by thousands of people across the globe. Focus Dailies lenses can be ordered online and delivered within Australia via this site. 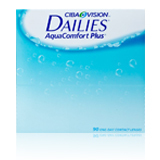 Focus Dailies are a product of CIBA Vision, a world renowned manufacturer of contact lenses and lens care products with a working history that stretches across three centuries. The Focus Dailies are fitted with advanced features designed to optimise comfort. Each box of Focus Dailies Aquacomfort Plus 90 is accompanied by 90 disposable contacts. This offers a convenient and comfortable approach to vision correction. The lenses within the Focus Dailies Aquacomfort Plus 90 Pack are easy to use. Patented LightStream Technology: The lens within the Focus Dailies AquaComfort packs are manufactured using the company's revolutionary LightStream Technology which results in a thinner edge and better quality. This makes it easier to fit and insert and results in a more comfortable wearing experience. High Water Content: Focus dailies are manufactured out of the material Nelficon A which increases the wetness. The lenses are capable of retaining over 65% of the moisture content. Triple Action Moisture: CIBA's Triple Action Moisture technology works deliver a three pronged approach to keeping the lens wet and comfortable. The lens is lubricated in the morning using a popular lubricant found in comfort drops. The lens stays wet during the day by working with a moisturising agent combined with another wetting agent, creating a comfortable and natural feel throughout the day. Resistant Surface: Aquacomfort Dailies Lenses are manufactured out of a non-ionic surface which is more resistant to the buildup of protein compared to other brands of contact lens within its class. Blink Activated Moisture: Dailies lens counteract the drying effect of blinking with a patented blink-activated solution. Moisture is delivered from within the lens with every blink over a span of 20 hours. The Focus Dailies Aquacomfort Plus 90 pack can be bought at different prices. The cheapest options are however available here. We offer delivery to any location within Australia. Members of Australian health funds can get rebates on their lenses too. This is an effective way of cutting down on how much they spend. Contact Lenses Online is recognised by close to three dozen Australian Health Funds. Buyers are issued receipts which can be used in applying and securing rebates. Focus Dailies offer a comfortable viewing alternative to using glasses. There are however other benefits to be gained. The following are a few of these. Users get to enjoy the experience of wearing a brand new pair of lens every day. This drastically reduces the risk of irritation caused by protein buildup. Comfortable and natural fit thanks to its moisture retention and wetness features. No need to worry about cleaning or investing in lens solution. Can be carried during trips through the airports where strict laws forbidding the transportation of chemicals are in effect. The lenses within the focus Dailies Aquacomfort Plus 90 Pack are already treated and therefore do not need to be re-cleaned with cleaning solution. For the best comfort, lenses should be protected from fumes or smoke when worn. Unused lenses should remain in their packs at all times. It is important that people choose lens strengths that have been specifically prescribed by their optometrist. This will ensure that they do not worsen their vision. Eye injury that may be worsened with the sustained use of a contact lens. For the best user experience, contact lenses should not be worn when swimming or using the hot tub. The humid condition caused by these environments can increase a person's risk of developing an infection. The Focus Dailies Aquacomfort Plus 90 Pack is a suitable option for wearers who wish to enjoy convenient and advanced comfort. They can be easily discarded and are a great option to have during long vacations. Because they are used daily, they are less likely to cause irritations or allergies triggered by protein build up. Their comfortable design makes them a good entry option for patients who have never tried using contact lenses before.